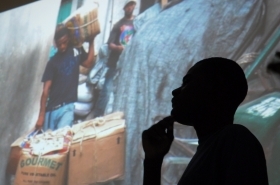 Jouk Li Jou Kan Foto 2013 – OVERVIEW, IMPACT, and THANK YOU’s! 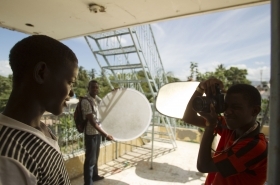 – A group of 10 international volunteers including professional photographers, translators, and assistants from the U.S., France, and Haiti led this year’s Jouk Li Jou Kan Foto. – 30 photojournalism students from Cite Soleil and Jacmel, including two enthusiastic new students, shot daily life assignments in and around Jacmel along with a maternity clinic, recycling business, a rally by Christians against homosexuality in Haiti, weddings, workers, market life, fire fighters, the local DJ, barbershops, Vodou, and sports. 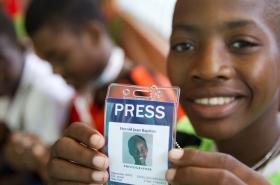 – Every student received a badge and camera, and advanced students got a Press Pass. Each year a volunteer takes new portraits of each student, and once again Kuba took the lead on arranging the most beautiful Group Shot ever! – Our star student, Fedno Lubin, was presented with a new (used) Nikon D200, two lenses, an awesome new camera bag, and accessories (donated by over four generous folks) for his hard work during the past 10 months documenting all of ACFFC’s activities, events, and mosaic mural creations. He is so happy! 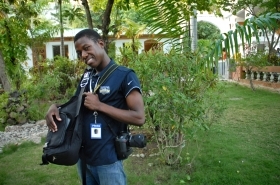 Now other students are stepping up and working harder knowing that they too can become photographers with real gear. – Daily one on one editing sessions with team leaders. Our critiques were more challenging for the students this year and many had to re-shoot their assignments. They let us know how much they appreciated us pushing them and always showed up with better images. As educators, we love that! – Local portrait studio owner, M. Dennis, visited our class to talk about business and how photography has enriched his life. He invited students to check out his studio, and collaboration will continue. – Blogging workshop led by Josh Curry that culminated in www.JacmelNewsBlog.com. All content is by our students. – Kristin Adair coached a basics and review session for beginning and newer students. 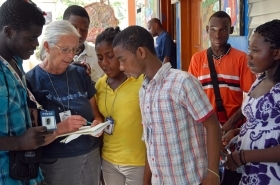 – Volunteers donated books and magazines creating a Photography section in ACFFC’s new library. 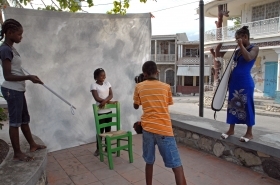 – Students photographed locals willing to pose during two outdoor studio portrait sessions at Toussaint Louverture Parc. Set up included studio backdrop, hand painted canvas backdrop by Bruno Rene and his art team, painted chairs, and reflectors. All photographers, assistants, and coordinators were students. – Business development class for advanced students held by Guy Pantaléon with assistance by Vladimir Simeon for two hours midday for three days. It was the first time students took a final exam on a computer. Passing students received a certificate during our opening night exhibition reception. For the two that didn’t pass, they still did well and we now know what help they need. – Portrait lighting class in an indoor photo studio led by Jakub (Kuba) Mosur. 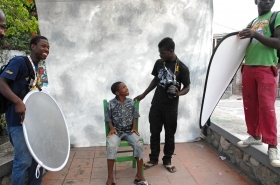 Students set up backdrop, light stands, flash, umbrellas and took portraits of ACFFC kitchen staff. There were also mini practice sessions throughout the week where students learned more about using reflectors – an important tool considering that electricity isn’t always available. – Every student filled out a short questionnaire so we can better assess future needs and interests. – This year our “Favorite Photo” discussion was again a great success. 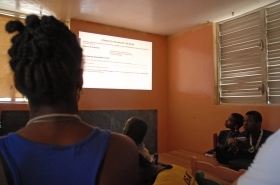 During an afternoon at the Hotel Cyvadier Plage conference center, students chose their favorite photos and talked about them in front of the entire group. Many brought their notebooks where they had written names, ages, and information about their subjects. Topics and Q & A included small business, stories about firefighters and hard workers, good light, difficult choices, personal stories about subjects and family, and a recycling discussion with guest Sarah Wallace. The making of Jouk Li Jou Kan Foto is truly a community endeavor! 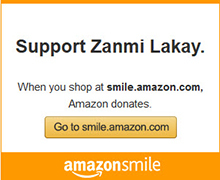 There are so many of you to thank! 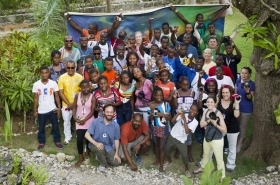 Special thanks to Director Georges Metellus, all of the kids and our students, and the entire staff of Art Creation Foundation for Children (ACFFC) for being our longtime partners and providing love and facilities, to Kole Zepol and our students from Cité Soleil, and to Prince Luc and the Fosaj Art Center for supporting the Jouk Li Jou Kan Foto exhibition three years in a row. It is a source of pride that we utilized local businesses for the production and efforts needed to accomplish a successful Jouk Li Jou Kan Foto. Thanks to Bazile Steverno for creating the fabulous banner that hangs across Avenue Baranquilla for the duration of our exhibition (Sept. 9), Jacub at Star Car Rental that always gives us personal service for cars and vans needed to transport our crew, and Serge – our awesome and reliable local Jacmel driver. Thanks to Christophe and the entire staff at Hotel Cyvadier Plage who took care of us providing great service and space throughout production. We love all of the talented folks who performed during our opening night reception including Amanou and his Troupe Flambeau Zel Maturin, multi-talented dancer/teacher/special assistant Papouche who performed solo and with his Explosion Dance Troupe, Rasin Travay Ayiti, and all of the drummers and dancers. Always thankful for Madame Resia, ACFFC’s top chef, who provides food for the kids, and coordinates the popcorn making for our opening night reception. 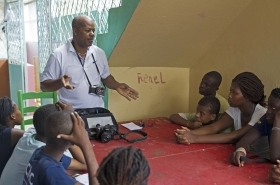 Huge thanks to our sponsors who provided sponsorship for Cité Soleil students, and materials and supplies helping to make Jouk Li Jou Kan Foto 2013 such a success! Charity4Life, Hotel Cyvadier Plage, Calumet Photographic, Clif Bar & Company, MOAB by Legion Paper, Cartridge World of San Francisco, and Ball Chain Manufacturing Co.
Heartfelt thanks and appreciation to all of our supporters who held fundraisers, donated funds, cameras, and other needed items directly or through Indiegogo. We know you dug deep and made special efforts because you believe in what we do, and honestly we couldn’t do it without you. 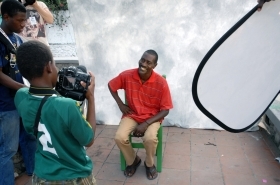 You were with us and our students everyday in Haiti bringing Jouk Li Jou Kan Foto to life! We thank you all, and are so proud of the achievements of our students! Jouk Li Jou! ← Previous PostYou are invited to our Jouk Li Jou Kan Foto 2013 Exhibition!